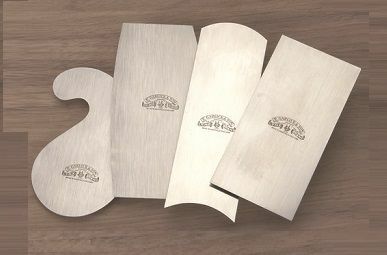 Card scrapers, cabinet scrapers: sharpening, using? I’ve never heard of card or cabinet scrapers until recently. I think I’ve been missing out on a crucial tool, for things like cleaning glue lines or removing marks from my misaligned #4 plane. Do you use them for final finish? Do you have fancy sharpening techniques, or simply file them square? Lots of rookie questions but the information I’m finding online, and on old posts here, is all over the place. I do consider card scrapers to be indispensable. I have several sizes and use them frequently, especially on pieces that are prone to tearout or where I just need to work a small area. For larger areas that need scraped, I have a #12 scraper plane. I rarely leave a scraped surface as final, but have and others do so more often. Using a holder or cabinet scraper, such as a Stanley #80, is a good idea if doing large surfaces and you don’t have a scraper plane. A card scraper get really hot in a short time, so becomes uncomfortable if doing very much at one time. For sharpening, square them off and then pull a small bur with a burnisher. This video by William Ng is the one that first got me to understand how a card scraper should be sharpened. my grandfather made some out of old saw blades….... I wish I had them in my box today. they come in several different profiles and sizes and are not expensive. a nice tool to have. ya know ive got them but just never seem to use em.im a power tool junkie so if it cant be plugged in it doesn’t get much use in my shop-lol. i used them in place of sandpaper. If a plane can’t smooth it or it’s in a tight spot I scrape it. They’re especially good on curved surfaces in the same plane like a lot of cabriolet legs made today. I use them on 3 dimensional surfaces as well. I’ve almost completely abandoned sandpaper because of scrapers. Planes handle the majority but that can’t get into every space. There are places where nothing else will really do the job as well. I use them a lot. Ditto. Perfect example. You could use sandpaper but it can soften the edges. I’m also a card scraper junkie. Mostly I use my Shapton stones to prepare the edges I find the surface is better and they cut longer. After lots of drawing out with the burnishing tool a file helps to reshape worn out edges. Then back to the stones. William Ng has a good video on scrapers. yes i agree check out his vids on using and sharpening scrapers. ya know you guys have reawakened me,i think its time I got mine out of the darkness and started taking them a little more seriously! 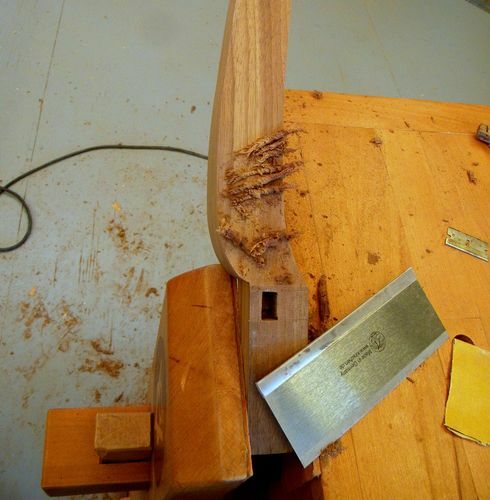 and the perfect time is now with the maloof rocker I’m working on.this is what lj’s is all about,inspiring each other! Aw heck Pottz, I was gonna help you clean out your shop by taking your scrapers off your hands. But now I’ve got such a mouthful of SPAM I can’t concentrate anyway. Anyway it looks like most folks just use the cards, which are flexible, rather than using them in a holder; or you can use a scraper plane, which basically holds an iron at 90 degrees to the surface? Still trying to understand these tools. Plus this talk of burnishing, coincidentally the first thing I read on the subject was here on LJs in a post by Todd A Clippinger, http://lumberjocks.com/toddc/blog/6753 who says you don’t need any of that, just swipe the bottom with a file at 90 degrees. Thoughts on that approach? Clearly I need to try this myself… recommend a starter set anyone? You can get a set like John Smith posted at Rockler. That’s where I got that same (from the looks of it) set. Mine are made by Crown Tool. I have to get the learning curve of getting the proper burr on them, though I have used them a couple of times. I’ve only tried 4 brands but LJ’er bearkatwood (aka Brian) makes the best card scraper I’ve ever used. It was also mentioned in PW recently. I got one a few weeks back and I love it. There are certain times when it far excels past sandpaper. Mine was about $10 from Woodcraft, it’s about 2”X5”. I opted out of purchasing a burnisher and instead use the shaft of a longer screwdriver. Works like a champ and saved me $25….and it’s not a one trick tool! I’m still in the learning curve with card scrapers. I have found them to be wonderful addition to my arsenal. The whole sharpening skill is a work in progress. I probably don’t use them as often as I should.